It is a truism to say that trees provide wood or timber. Timber (or lumber in the States) is wood that has been processed into planks or beams, part of the process of wood production. Timber may be supplied either rough-sawn, or surfaced on one or more of its faces. It is available from many species, usually hardwoods; but it is also available in softwoods, such as white pine and red pine, because of their low cost. Finished timber is supplied in various standard sizes, mostly for the construction industry—primarily softwood, from coniferous species, including pine, fir and spruce, cedar, and hemlock, whereas hardwoods are for high-grade flooring and furniture. By-products of timber production are sawdust and saw flour. Wood flour is very finely ground or pulverised wood, the particles can range from those in a fine powder to those the size of a grain of rice. 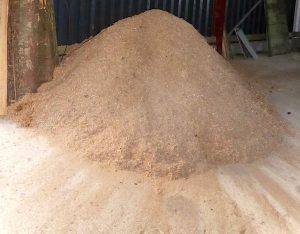 Sawdust or wood dust is also a product of the cutting, drilling or grinding of wood with saws or other tools / machinery. Both wood flour and sawdust do have a number of uses. 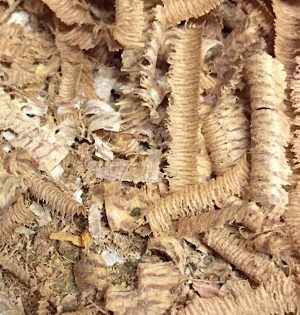 Sawdust, for example, can act as a mulch or indeed as fuel (as in the manufacture of charcoal briquettes - for BBQ’s), or in used in the making of particleboard. Wood flour is used as a filler in resins such as bakelite or linoleum floor coverings and wood/plastic composite building materials. However, research workers in the States are now working on a technique to use sawdust for oil remediation - especially dealing with oil spills in the cold waters of the Arctic. The containment of oil spills in these cold, icy waters is especially tricky. These waters are being explored as fossil fuel developers are now looking north, and new techniques are needed for these extreme conditions. The movement of the ice pushes the oil below the surface, making it more difficult to collect. Rough weather disperses the oil. can stay afloat for months. This modified saw dust can absorb up to five times its own weight of oil. Apart from absorbing oil, it can also help in combatting an oil spill as it can help with a controlled burn. If oil is moving towards a sensitive area fast, it can be burned before it does further harm. This in situ burning reduces the amount of oil in the water and hence environmental damage. Work is now ongoing to see if oil-eating microbes can be attached to the powder to degrade the oil.